Millward, Jessie (1861-1932): Made her debut in 1881. The following season, she appeared with Henry Irving and performed several Shakespearian roles. 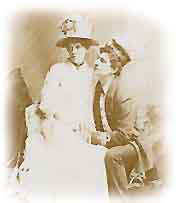 In 1885, she began her partnership with William Terriss at the Adelphi appearing as Dora in The Harbour Lights. The piece ran for 217 nights and 243 the following season. Many dramatic successes followed until the murder of Terriss in 1897. Millward continued acting but never with the success she had enjoyed with Breezy Bill.